Re-scan the document at lower resolution. This usually is the quickest and easiest fix. If you scanned the document in color, try scanning in gray scale. If your gray scale scanned file is too large, try scanning as Black and White (1-bit resolution). Re-scan the document in parts (or separate one document into several smaller documents) so that each individual file size is less than 1 MB. For example, Part 1 and Part 2; or Main Document and separate Addenda documents. Scan each page of a multiple page document as an image, save each image as its own file, and then use the Create PDF tool in CTI Navigator Desktop's Document Manager to link these image files together in one PDF document. For instructions on using CTI's create PDF tool, see "Use Document Manager & Create PDF" on CTI's Help and Tutorials website. If you cannot reduce the file size sufficiently with a scanner, do not have a scanner, or your original is a text file (such as a Word, PowerPoint or Excel document), you can print the file to a third-party PDF printer utility that will electronically convert its format to PDF. Many popular PDF converters are free to download and use (such as Cute PDF Writer, Bullzip PDF Printer, or PDF Creator), although some may display advertising either in the document or during the creation process. To convert an existing document (or image) file to a pdf formatted file, you also can use free web-based document conversion services that do not need to be installed on your computer (such as http://convertOnlineFree.com/ , www.freePDFconvert.com, http://docuPub.com/pdfConvert, or www.zamzar.com) . Some third-party PDF converters, such as http://docuPub.com/pdfConvert, offer compression options to help reduce the size of a PDF file. Click the button beside "Quartz Filter" and select "Reduce File Size"
There are several free online tools than can be used to reduce the size of pdf files. To reduce the size of up to 20 PDF files online, go to http://pdfcompressor.com/ . Unlike some other services this tool doesn't change the DPI, thus keeping your documents printable and zoomable. Large images should be reduced in size (to 55 KB or less) before adding them to a flyer or custom report in CTI Navigator. You can use the basic image management tool called "Paint" that is included as an accessory in all supported versions of Windows to resize images. In Windows 10: click the Search icon or box, type Paint, and click on the Paint desktop app. In Windows 7 or Vista: click the Start button > click All Programs > click Accessories > then click Paint. Click File in Windows 10 or 8 or on the Paint button in Windows 7/Vista > click Open > select the picture or image you want to resize > then click Open. In the Resize and Skew dialog box, select the Maintain aspect ratio check box so that the resized image will have the same aspect ratio as the original picture. To resize your picture by a certain percentage, click Percentage, and then enter a percentage to reduce the width by in the Horizontal box, or a percentage to reduce the height by in the Vertical box. To resize the picture so it's a specific size, click Pixels, and then enter a new width in the Horizontal box, or new height in the Vertical box. Click File in Windows 10 or 8 or the Paint button in Windows 7/Vista > point to Save as > then click the picture file type for the resized image. To maintain the original width-to-height aspect ratio, enter the same percent (such as 50%) for both Horizontal and Vertical under Stretch. Note: Do not enter any Horizontal or Vertical Degree value under Skew. Click File > "Save As" > enter a filename > click Save. Third-party photo editing programs (such as Photo Shop or Paint Shop Pro) also can be used to resize graphical image files. Alternatively, you can use free photo editing programs such as PIXresizer (download), Shrink Pictures (online), FlipMyPhotos (online), Google's Picasa (download), Google Photos, or GIMP to easily reduce the size of an image. 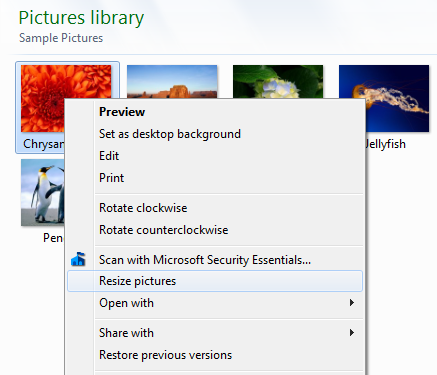 You can easily rotate a photo or scanned image in a clockwise or counterclockwise direction in Windows as follows. Open the image in Paint (one of the Windows Accessories apps). Select Rotate Right 90º, Rotate Left 90º, Flip Vertical, Flip Horizontal. Open the image in Paint (one of the Windows Accessories programs). In the box that opens, select to flip an image horizontally or vertically, or rotate the image by 90, 180, or 270 degrees. 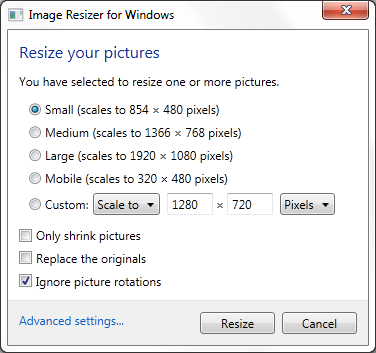 PIXresizer (download) can be used to both rotate images and reduce their file size. To rotate a photo on a Mac, launch the iPhoto app. Then select File, Import, Rotate Clockwise (or Counterclockwise). Online service: You also can resize, rotate, flip or crop an image in your browser by using an online image editor such as the free Google Photos, or FlipMyPhotos. For additional information on using Photos in CTI Navigator, see also "Fix Photo Quality Issues (Resolution, Orientation, and Image Sharpness)." To go to CTI's Menu of Error Fixes, click here.